Admiral's Yard provides a wide range of self storage facilities including individual storage, private storage for domestic self storage and business self storage customers. All of our storage units are at ground level allowing you to drive your car van or lorry right up to the unit for easy and fast direct loading and unloading. 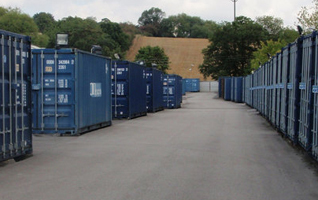 At Admiral's Yard our Self Storage Bristol unit is located in North Bristol close to Patchway Railway Station and the Almondsbury M4/M5 interchange with great access to all of North Bristol and South Gloucestershire. At Admiral’s Yard our Self Storage Slough unit is the largest storage facility located close to M4 Junction 6, adjacent to the town centre. Visit our main Self Storage Slough page for full details. At Admiral’s Yard our Self Storage Leeds is located just 1.5 miles south east of the city centre on the main A61 at Hunslet, particularly convenient for the motorway and the city centre. At Admiral’s Yard our Self Storage Sheffield & Chesterfield facility is located mid way between Chesterfield and Sheffield and conveniently situated in Rotherside Road, Eckington on the A617, just three miles from Junction 30 of the M1. Here at Admiral’s Yard, our prices are extremely competitive, allowing you great deals on your self-storage needs. Admiral’s Yard offers you an economic solution to both business and domestic requirements. Other companies may offer unrealistically low introductory prices, but these won’t last forever, unlike the considerably lower costs that you’ll always receive at Admiral’s Yard. Contact us today to find out about our great prices and services. Privacy and security are paramount here at Admiral’s Yard. Whether you purchase a padlock from us or bring your own, you alone have access to your goods. We use the latest security camera equipment, alarm system, and communications technology for all our self-storage facilities, so you can rest assured that your belongings are being monitored 24 hours a day, 365 days a year. With protection and security as high priorities for us, we bet they will be for you too. You can purchase goods insurance from us, or alternatively, you may carry your own insurance. We strongly state that all goods must be insured, not only for your peace of mind, but ours as well! Contact us today for more information regarding our insurance and other services. Contact us today for more information regarding our insurance and other services.